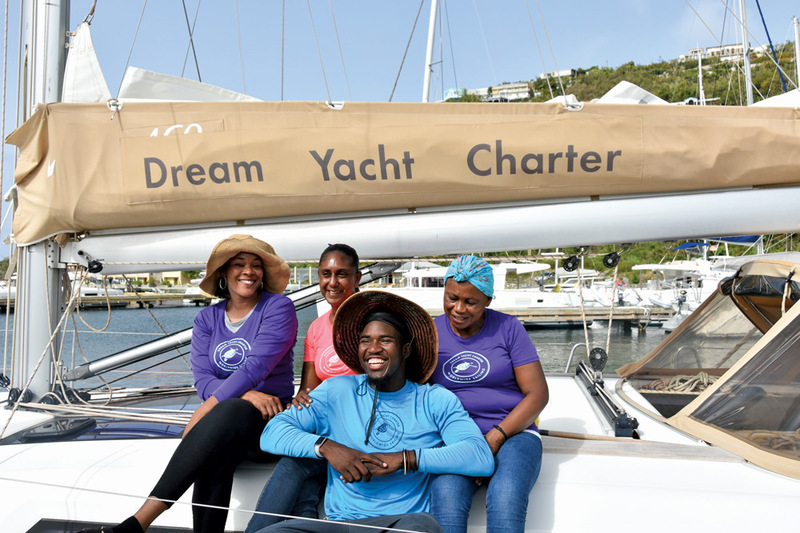 Dream Yacht Charter took the opportunity to move its base across Tortola to Scrub Island, home to the luxury Scrub Island Resort, which survived the storms relatively intact, allowing it to get up and running quickly. Smaller companies that took a little bit longer to recover are now also operating near full strength. Dream Yacht Charter employees at the company’s BVI base are all smiles, now that the hurricane damage is in the rearview mirror. While many of the surviving plants and trees have sprouted regrowth, some of the islands’ indigenous trees and vegetation that make up the islands’ unique ecosystem need to be replanted. After the neighboring islands of St. Vincent and the Grenadines donated 3,000 fruit trees, the Seeds of Love Program was formed to raise awareness and money to buy seedlings and saplings that will be planted by BVI residents, guests and local organizations (www.seedsoflovebvi.org). Some of the first businesses to get back online were the BVI beach bar mainstays Soggy Dollar Bar and Foxy’s on Jost van Dyke. Foxy Callwood first set up his Tamarind Bar in 1968, and has received numerous awards, including a Member of the British Empire from Queen Elizabeth II. Local residents gathered at Foxy’s post hurricane for meals and information, and the bar officially opened a month later. Foxy’s Taboo, the Tamarind Bar’s sister restaurant that was completely destroyed during Hurricane Irma, reopened on New Year’s Day this year with a big “Float-illa” that drew more than 35 catamarans from yacht week. Jost van Dyke’s other iconic stops such as Ivan’s Stress Free and Seddys One Love are fully rebuilt. Even Sidney’s Peace and Love has recently reopened, having been completely rebuilt after a ferry boat landed on it during the storm. Another popular BVI stop for sailors was the Bitter End Yacht Club on Virgin Gorda. All of the buildings, guest cabins and docks were destroyed. Currently the 64-acre property has been cleared of 3,000 tons of debris, with plans to have a new marina open by the end of the year. In the meantime, the family-owned company is selling Bitter End Provisions, a line of sailing-related clothing and a portion of each sale goes to the Bitter End Foundation, which raised more than $80,000 as the Bitter End Irma Relief Fund to help local residents following the storms. Its continued mission will support conservation efforts in the area. Sailors have long enjoyed a painkiller at one of the Pusser’s Rum locations in the BVI, and a stop at Marina Cay off Tortola with its iconic red English telephone booth on the dock was a must. This resort and marina was wiped out by the hurricanes, but it is now in the process of rebuilding. The good news is that the red box was found buried on the seabed quite a distance from the dock, and although it is made of solid cast iron, weighing around 1,500 pounds, the plan is to replace it on the reconstructed dock. A restaurant is now open on the Marina Cay patio and the mooring ball field is back in action. The area’s other Pusser’s bars and restaurants in Roadtown Pub and Soper’s Hole are fully back in business. For a full list of business that have reopened and more information on the islands, visit www.bvitourism.com.